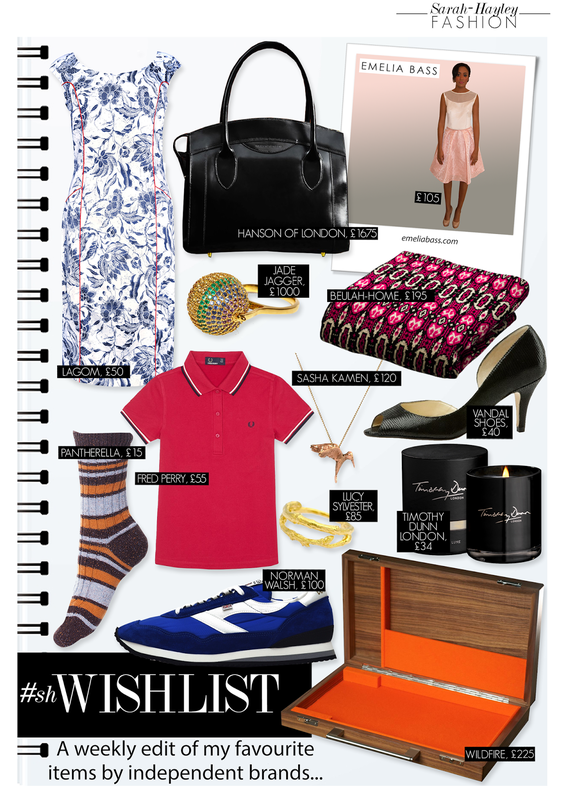 SEVENTEEN - The #shwishlist - A weekly edit of my favourite items..
Today I am attending the launch of #BuyBritishDay at The House of Commons, this inspired me to bring you a wishlist featuring British labels. The first ever #BuyBritishDay will take place on 3rd October2014. The initiative established by the Best of Britannia show is to encourage customers to support brands and businesses that design and manufacture their products in Britain. I am proud that we have amazing brands that happen to also be British. Allow me to introduce you to some of my favourite this week. Vandal Shoes have been creating women's shoes in Norwich for over 75 years. My favourite style is the Morston in black lizzard print. Currently in the sale these shoes are a fabulous bargain as they would suit for so many occasions. I saw Wildfire cases completely by chance while searching for a new iPad case. The brand create wooden MacBook cases using impressive craftsmanship. I have opted for the Landsdown which features a darker wood with a flame orange lining. I have always loved stylish and practical products and Wildfire fabulously put this into practice. Oxfordshire based jeweller Lucy Sylvester is one of my instagram friends. I love seeing her feed where she shares what she has made and how she uses our mutual love of the British Countryside as her inspiration. I adore this twig ring for its ultimate simplicity. Made from silver and 18ct gold vermeil it is a piece you can look at with memories of the countryside. I am really excited about womenswear brand Emelia Bass, established by two friends, Noor Albazie and Kawther Mokhlif. The clothes are elegant, modern and made to flatter the female form. My favourite piece is the 'Monaco Dress' because not only is it pink but it is also fabulously feminine. The brocade skirt works perfectly with the chiffon overlay bodice and I love the unexpected low-back. Newly launched homewear brand Beulah-Home create luxury knitted cushions, throws and pet blankets all knitted and manufactured in Britain. I love blankets, even on a hot day you will find me wrapped up on the hammock with a knit for comfort. I think the Daphne throw is my ultimate favourite due to its texture and mix of colours although I have fallen for practically everything on their website. Trust me, you will too! Adding a sporty element to my shwishlist this week is the Ensign casual shoe from Walsh UK. I discovered these on instagram with the #BuyBritish hashtag. I loved the blue shade and decided to learn more about the brand. Founded by Norman Walsh in 1961, Norman began his career aged 14 and by age 16 he was selected to make running shoes for the 1948 British Olympic Team. The brand went on to develop footwear for a variety of sports including rugby, football and fell running amongst others. Today the brand continues to build on the heritage and history established by Norman Walsh. I have a feeling the Ensign isn't unisex but I am more than confident us ladies can pull them off!